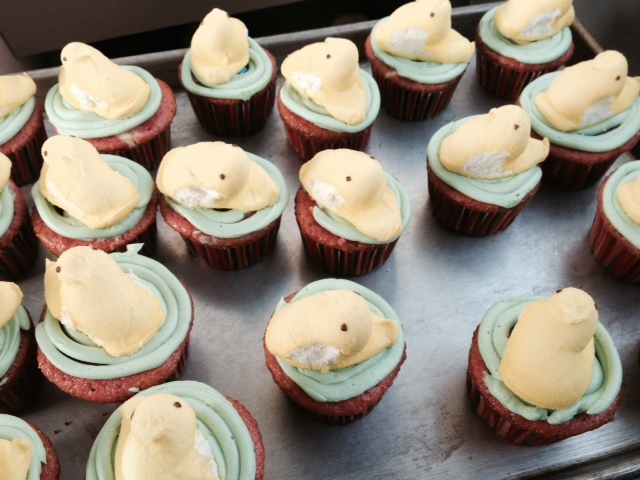 We had a little fun with our Easter cupcakes yesterday! 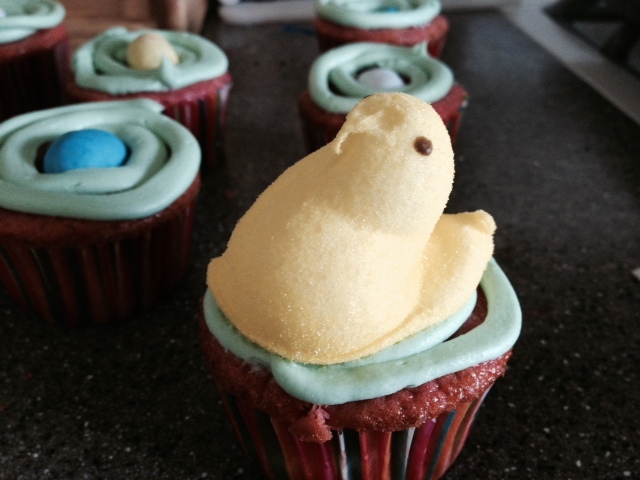 You can’t go wrong with a strawberry cheesecake cupcake base; add a little surprise center, and top with a festive Peep (which I really hate, but look darn cute sitting on their little cupcake-birdie nest!). 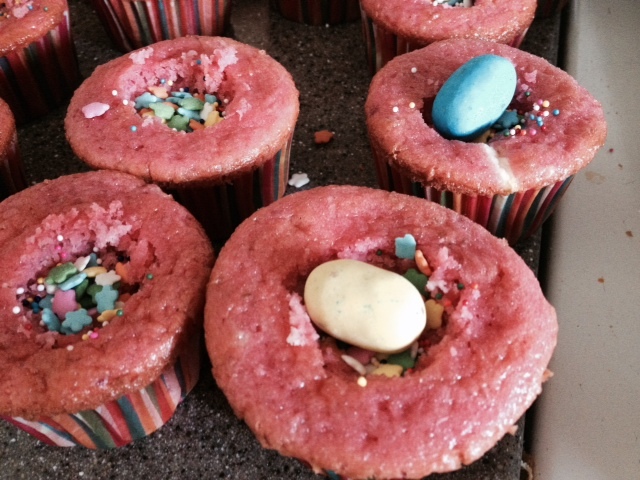 The kids had fun putting the eggs on, and I had fun eating all the of the cupcake centers that I had to scoop out to make the nest. 🙂 Win, win!!! Preheat oven to 350^F. Make cupcake batter by combining all ingredients and mixing until completely incorporated. Make filling by doing the same. Spoon or scoop about 1/4 cup of cupcake batter into prepared cupcake cups, filling it to 2/3 full. Spoon a generous Tbsp of the cheesecake filling over each cupcake. Place cupcake pan on the center rack of the oven and bake until tops spring back when lightly pressed with a finger – about 20-25 minutes. Cool 15 minutes or longer before frosting. 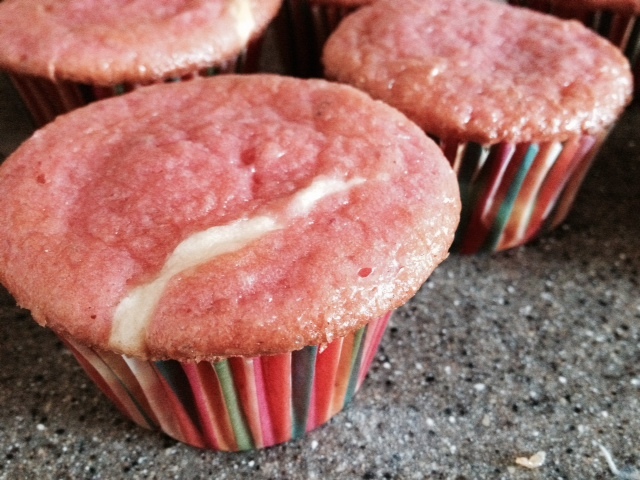 Scoop out a tsp size hole in the middle of each cupcake and fill with sprinkles. Top with a candy egg. Swirl frosting around egg, like a nest, and top with a Peep.